"I use VocALign to tighten harmonies and doubled vocals, and frankly I couldn’t live without it. It would take days of strenuous tracking to get harmonies that tight." "VocALign is a totally invaluable necessity for what I do. We do a lot of sitcoms: Seinfeld, Friends, Third Rock from the Sun. We use VocALign on almost every show we do. I can't live without it"." If you need more power and functionality than available in VocALign Project 3, we recommend VocALign Pro 4 or Revoice Pro 3. VocALign Project 3 uses iLok for authorization to give you portability, simplicity, and protect your investment. Starting with VocALign Project 3.3, trial and full licenses now use simple computer-based authorization using a FREE iLok account (ilok.com). Upgrades are available for owners of older versions of VocALign Project. Visit our store for upgrade pricing information. You can try VocALign Project 3 free for 14 days if it has not been run before. 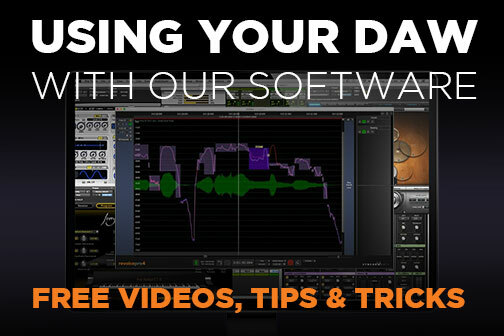 Get more information about your DAW working with VocALign Project 3.